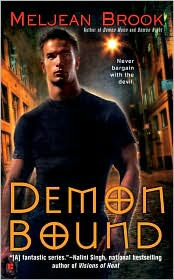 Demon Bound by Meljean Brook was a solid addition to this paranormal series. The hero Jake and the heroine Alice "the Black Widow" were both likable characters that at first didn't seem to fit together. Jake is an extrovert who doesn't think before he speaks. He comes off as young and exhuberant, but there's more to him than just his runaway tongue. Alice, is an introvert and a repressed woman... both sexually and socially. She uses her Gift, that of using spiders, to keep away those around her and has done so successfully throughout the centuries. She can come off as more than a bit creepy at times, and Brook handles that very well through Jake's perspective. Although this installment is not as sexually explosive as the previous ones by any means, there is a definite connection between Jake and Alice. The best part of the book is that through Alice and Jake's slowly developing romance, the overall storyarc really moves forward in Demon Bound. Brook introduces new intriguing characters that we'll be seeing in future installments, and there are significant revelations as well. The resolution to Alice's conflicts will definitely have a huge impact on all the Guardians and their future. This is a key book in this series that should not go unread. I enjoyed your review, I have never read any books from this author, and I love reading the Paranormal, and this book sounds so fascinating and intense. It is definitely on my 'To Read' list. I love Meljean's writing and have been a big fan of this series for a long time, but I fell behind in the last year!!! This is the next Guardians book for me and you've so kindly reminded me to get going with it again. I'm going to try to bump it up my queue. I loved that too, the way they were so at odds at first, and how outcasty she was. So fun to read about your progress here!! Queen of Romance, this is definitely a PNR series I'm enjoying. This is the 4th novel in the series, although there are some novellas that don't necessarily need to be read. They should be read in order: Demon Angel, Book 1, Demon Moon, Book 2, Demon Night, Book 3, Demon Bound, Book 4, Demon Forged, Book 5. Hope you enjoyed them! Nath, I definitely enjoyed Jake's character. :) I agree that he was different from the other intense males in this series. Leslie, I'm making my way through this quickly because I'm enjoying it SO much! When I finish one book, I can't wait to read the next. ;P Hope you get to it this year. Renee... ohhhh can't wait to read what you think of Lillith and Hugh! Christine, we BOTH love Meljean's writing. I can't stop reading this series. I now have one more book and I'll be caught up. CJ, these two were so different and she was SO out there... it was just fun to see how they fit at the end. It was easy to make progress with this series, it's a good one! I think this book is next in my Guardian TBR list, so I skipped it - I hope that is OK? Oh Orannia! This book has so many important revelations in it! The outcome at the end of this book and the revelations I mention in my impressions changed the whole ball of wax in the series. Plus, there are characters introduced in this book that will be key in future installments. ALSO, the characters for Demon Forged (the next book in the series) are featured here.